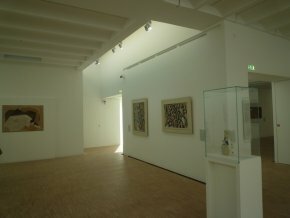 23/9/10 – Museum – Villeneuve d’Ascq, Musée d’Art Moderne – The Musée d’Art Moderne in Villeneuve d’Ascq, now called the LaM (Lille Métropole Musée d’art moderne, d’art contemporain et d’art brut), has just reopened its doors after four years of renovation. 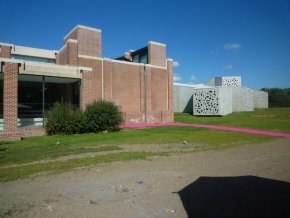 A new wing was built behind the original building to house the collection of “art brut” donated in 1999 by the association Aracine. We will not mention this selection here, although it is extremely interesting, as it falls outside The Art Tribune’s field of discussion, as does also the section devoted to Contemporary Art. However, we would like to point out how much we appreciate the architecture of the new building, designed by Manuelle Gautrand (ill. 1), which integrates itself perfectly with the old one despite the use of very different materials. Let us dwell a bit more on the “modern” collection, mainly drawn from the donation made by Jean and Geneviève Masurel. We were not familiar with this establishment before it closed and therefore cannot compare the present museum layout with the previous one. The new design is what might be expected today of this type of museum : a very light hang (perhaps too much so) and white walls, also a bit overly so without a doubt (ill. 2). We at times find ourselves dreaming of a museum of modern art which might dare to use colour, if only an off-white, to break the monotony created by this arrangement but it seems this is not the trend. This is a pleasant visit but not in any way surprising ; it could be just any other modern museum. The collection is however of very high quality, with important canvases by Picasso, Braque, Modigliani, Léger… , organized according to themes, in a disorderly way, reflecting its high points. The first room, with the pompous title of “Portrait(s) of a collection”, presents several paintings deposited by private collectors including a beautiful Portrait of Roger Dutilleul by Amedeo Modigliani, next to works by Roualt and Kees van Dongen. 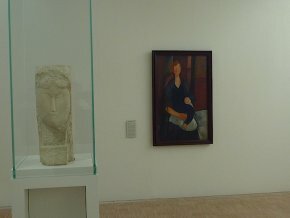 After a section on Primitivism around two sculpted wood figures by André Derain (ill. 3), the next room highlights Cubism, well represented, then Modigliani (ill. 4) and Fernand Léger (ill. 5). This is followed by a section called “The Permanence of Cubism”, and dares to confront Bernard Buffet and Pablo Picasso, something which probably no other museum in the world would do. Even if one does not appreciate the first (which happens to be our case), their comparison, intended by the donors who collected both, is very unexpected. They are perhaps ahead of their time and Buffet’s art might be reconsidered in the future. The last two rooms present Surrealism and Abstraction, then art in the second half of the 19th century, respectively. Obviously, this is a limited space and the selection of works is too small to allow for a complete survey of each. 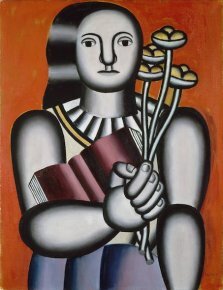 Rather than list missing artists, a little too cruel and unfair, we would like to point out instead a few important paintings such those by Victor Brauner, Joan Miro and Nicolas de Staël. Unfortunately a bit off the beaten track , the LaM, since this is now its new name, is well worth a visit, not only for its important collections historically, which we have simply outlined here, but also for its two other sections highlighting Contemporary Art and Art Brut. Collective work, Collections, Lille Métropole musée d’art moderne, d’art contemporain et d’art brut, 2010, Hazan, 256 p., 15€, ISBN : 9782754102209. This is not a catalogue, but rather a guide offering a selection of works on display with commentaries. To go there from Lille, take subway line 1 to the Point de Bois stop, then take bus 41 to the Parc Urbain/Musée stop.